This is the sixth in a series of videos culled from an interview about content marketing I did with Terry Foster of Cision Canada. Cision (the USA version) is also a sponsor of Convince & Convert and our Social Pros podcast. (here’s a post I wrote about their nifty content amplification tool). Terry: Given the amount of money that’s poured into content creation strategies, repurposing a content I think is something that every business needs to look at. So what are some tips would you give big and small businesses on repurposing content? Jay: Oh, you’re so right. We talk about that in my business and in my book. 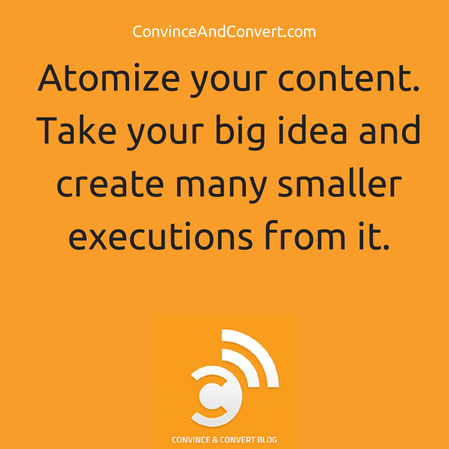 We call it atomizing content. I stole that from Todd Defren, from Shift Communications, who coined that term originally. But the notion is that you have an idea or a content tent pole, and what you should do is create 8 or 10 or 20 individual executions based on that big idea. One of the reasons that content marketing is hard today for a lot of companies is that they’re trying to reinvent the wheel every time. They’re trying to move a mountain every time they make a new eBook or something, and instead that eBook should also be 10 blog posts and should be 14 videos and 18 Instagram posts and 14 YouTube videos. You can take that one thing, like we’re going to do here. We’re doing a video program here on “The Influencers,” and you’ll be able to chop this up and use it in a lot of different ways. You want to chum as many different bodies of water as possible with your idea, and most people are just thinking about content marketing like you’re making Hollywood films. It’s not like that. Don’t reinvent the wheel. Just make more wheels. Terry: So what about long form versus snackable content in that respect. You know, making Hollywood movies versus snackable? Jay: Snackable. I think snackable. Here’s the deal. It used to be a five minute video, not that long ago, was kind of the best practice in corporate video. You sit down and watch five minutes. Unless you’ve got really compelling characters, five minutes seems like a really long time now in this era. There’s a reason why Vine is six seconds. There’s a reason why Instagram is 15 seconds, and that kind of format is seeping over into everything else. So it’s got to be tight, tight, tight, tight, tight, because partially this is technology. So many people are consuming content on a phone that their content consumption windows are becoming more and more abbreviated, and you’ve got to create content that fits into those smaller windows.